A drastic income tax cut proposal easily sailed through an Oklahoma legislative subcommittee this week, and that doesn’t bode well for the state’s future revenues. House Bill 3038, sponsored by 23 legislators, passed in a 9 to 1 vote of the House Appropriations and Budget Subcommittee on Revenue and Taxation. The bill, if approved and signed into law, would lower the top income tax rate from 5.25 to 3 percent and then gradually reduce the rate through 2022 when it would be eliminated altogether. It’s unsure if this specific proposal will prevail through the legislative process, but the sheer number of its sponsors and its easy approval by a legislative subcommittee means it’s almost certain some type of tax cut will be approved this session. Gov. Mary Fallin recently made cutting the income tax a major part of her State of the State address. The income tax currently provides the state about one-third of its revenues. Critics of the proposal say a drastic cut in the income tax will mean more cuts to state agencies and education, but those who support it claim economic growth created by the cut will help offset losses in revenues. The proposal would also eliminate tax credits, deductions and exemptions. That’s an argument that seems destined to be tested here on a grand scale and is based on the ideas of economist Arthur Laffer, who advised former President Ronald Reagan and spoke here recently in favor of the proposal. The so-called Laffer Curve maintains tax cuts generate economic growth. The Oklahoma Council of Public Affairs, the state’s conservative think tank, has also endorsed the Laffer plan. But the basic problem with a drastic cut in the income tax without an increase in other taxes is the uncertainty over whether economic growth will actually follow and, if it does, create enough new tax money to offset revenue losses. It seems like an obvious, dangerous risk, especially for a state that has implemented budget cuts in recent years because of previous tax cuts and the economic downturn that began in 2008. It would obviously be more prudent to make no cut or a smaller cut in the income tax rate right now to protect the state’s basic services and quality of life. 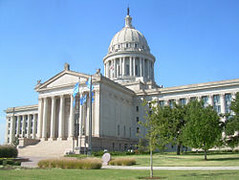 The Oklahoma Policy Institute, a progressive think tank, has made a compelling case against the income tax proposal, but so far the state’s corporate power structure has not forcefully opposed more income tax cuts like it opposed State Question 744, the defeated 2010 ballot measure that would have funded education here at a regional average. The proposed tax cuts, of course, will primarily benefit the wealthiest Oklahomans. It’s a risky game. Will new businesses come here if our educational systems face even more cuts and if our infrastructure continues to deteriorate? Probably not. Could the tax cuts be rescinded in the future if the predicted economic growth doesn’t happen? That’s extremely unlikely.